You can offer your ideas on functionality. 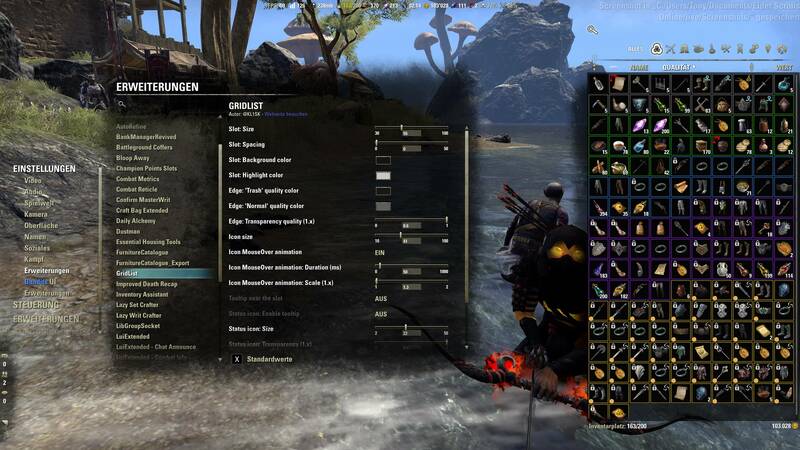 Inventory in the form of a grid based on ZoS functions. Button to switch the mode, from the left above the list. Additional skins and template for creating your own skins GridListSkins. It is recommended to reload the interface after changing the settings "/reloadui" (so that all windows are updated). Delays in updating directly depend on: the number of visible cells and add-ons that add new items to the list. Added icon price of items from merchants in the tooltip. Added a bunch of settings. Fix icon button change mode. Added setting "Edge: Brightness quality (1.x)"
In the settings, the format sliders (1.0) work as expected. Added the price of items from merchants in the tooltip. Added support and customization of skins. Fixed work: GridList + PerfectPixel + AutoCategory. Many changes in the code. Changed the name so as not to be confused with another addon. In the settings, an inventory window is displayed to facilitate setup. Tooltip anchor fix, in grid mode. Added button to switch the mode, from the left above the list. The tooltip is fixed to the left of the list. 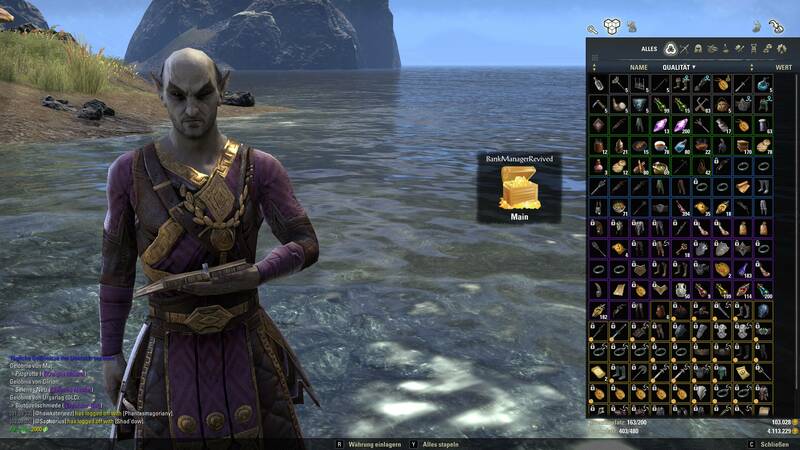 Added: INVENTORY, QUEST_ITEM, BANK, HOUSE_BANK, GUILD_BANK,	CRAFT_BAG. Love this addon . Thank you so much for doing this !! In my setup it takes a long time to load, default settings. Is there another addon interfering you might be aware of or is it something I might doing wrong? Oh wow, bummer, 6 sec difference. Thanks for the hint. Getting an error when changing the file size options, says "must be larger than zero and power of two." I think to remove this parameter altogether, since it has almost no effect on the view. And transfer data along with the texture used. Last edited by KLISK : 03/24/19 at 10:07 PM. If there is time, I will correct it today. Last edited by KLISK : 03/22/19 at 02:20 AM. Last edited by blackman_87 : 03/22/19 at 05:04 AM. 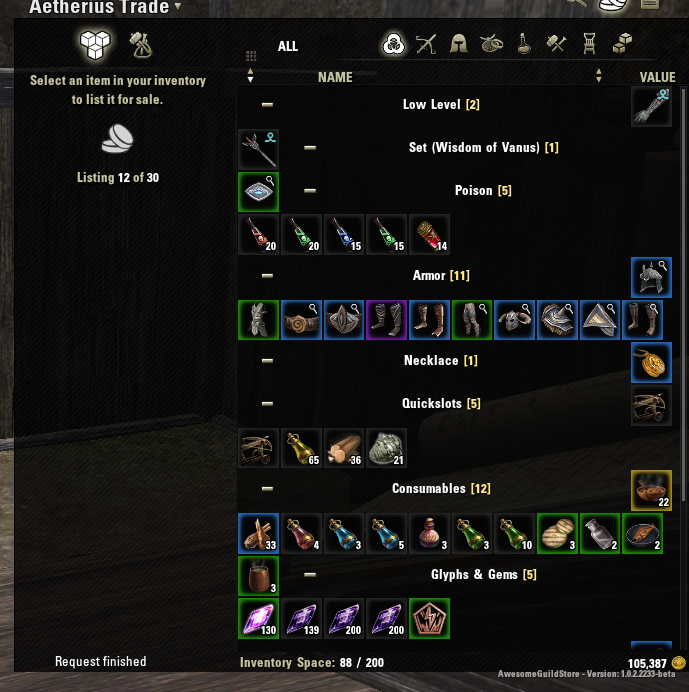 The one thing I can find is for some reason merchant prices wont show with this addon while it will on standard or Inventory grid view. Not sure why. I did not understand exactly where prices are not displayed? In any case, I'll see what's there. Yep, That fixed it! Thank you! Last edited by KLISK : 03/18/19 at 11:33 AM. Runs WAY smoother than InvGrid, Love it Thank you! Last edited by Austinseph1 : 03/17/19 at 07:31 PM. Thanks for adding support to the NPC vendor interface. I really like this addon, especially the toggle button and support for many different configurations. I added support for GridList in the latest Master Recipe List so you can see tracking icons in grid view. Thank you Phinix. Love your MRL. You need to update the list to apply all the settings, use the view toggle button. After setup, only inventory is fully updated. Last edited by KLISK : 03/15/19 at 01:47 AM. Last edited by Tonyleila : 03/13/19 at 07:22 PM.